Ladder ball is a game for all ages and skill levels. The skill is to find the right velocity and trajectory of the bola throw. There is a lot of luck involved once the bolas start wrapping around the horizontal rungs. Bolas will either remain in the rung or fall further down the ladder, thus scoring less points. It's during this time when we find the ooh and aahhs coming from players and spectators alike. For more rules, scoring and terminology, have a look at the Ladder Ball Rules and Play post. 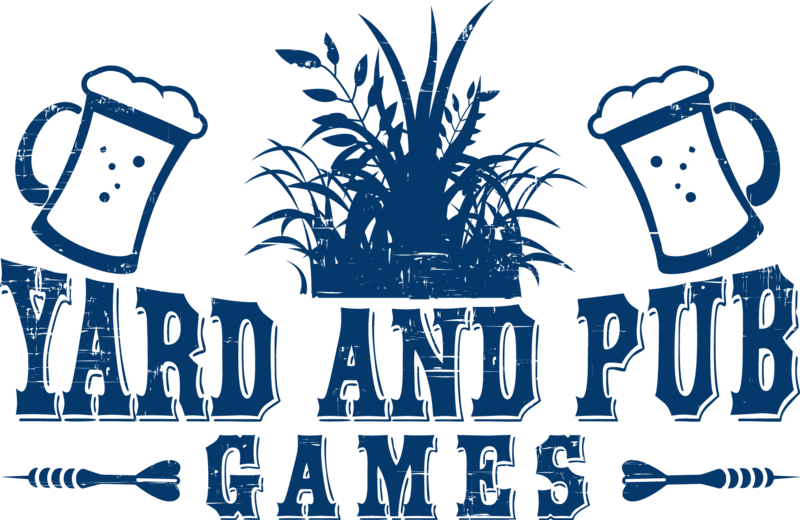 Yard and Pub Games play on all types of Ladder Ball sets, and there are some designs that stand out as both sturdy and stylish. We've played on home-made sets of PVC pipe and real golf ball bolas, but these sets featured below are certainly superior. We hope you enjoy our list of quality Ladder Ball games. Each one of these Ladder Ball sets are sure to bring you hours of fun. Each of our featured games comes with a carrying case for transport to the park or beach or neighbors yard. This is a high quality 100% bamboo, surf board shaped Ring Swing backdrop. Of course it comes with everything you need to set up along with instructions. Perfect for a back porch or garage game room. We like the beachy theme and the bodacious ting the ring and hook make when they hit. As with most of the items on this list, get free two day shipping with your Amazon Prime membership.